The MACH1™ and MACH2™ building controllers are now available in an enhanced format from Reliable Controls. The new models feature a stronger, faster microprocessor and larger memory to allow for BACnet® functionality such as Alarming, Schedules, Calendars, Trending, as well as, support for new Control-BASIC functions. 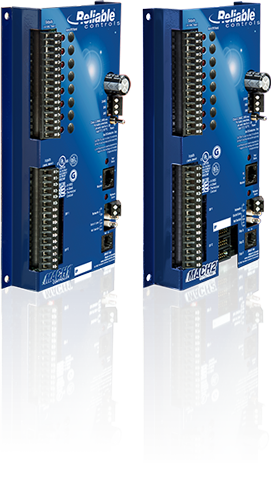 As released, the enhanced MACH1™ and MACH2™ controllers exceed the BACnet Building Controllers (B-BC) specification.